Babblings of a Mommy: Beauty Tip Of The Day: False Lash Look Without The False Lashes. Beauty Tip Of The Day: False Lash Look Without The False Lashes. "You don't have to go through the trouble of applying faux lashes to get a dramatic lash look. Instead, layer different formulas of mascara, starting with a thickening one and finishing with a lengthening one. And, to minimize clumping, which is likely to happen when you're swiping on multiple coats, always wipe or blot your wand of excess mascara before applying"
I started doing this and I'm LOVING the results!! I'm using Maybelline Falsies Mascara for the thickening one and Laura Mercier Long Lash mascara for the lengthening and it really does make a huge difference. If you want more dramatic lashes definitely give this tip a try! I WILL TRY IT!! Thanks!! I will try this too! I hate to waste the product by wiping it off, but I will for the sake of purrrttty lashes. :D Thanks! Ann: You don't need to waste product! 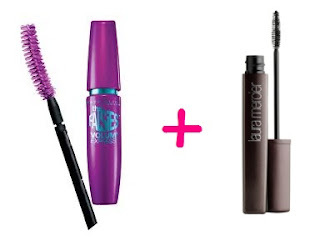 Just wipe the wand against the opening of the mascara bottle until it doesn't seem so thick anymore. Great post - always looking for new "beauty" tips!